Sign up to Dry July Australia 2018 and raise funds for St George Hospital. Here at St George we provide multidisciplinary specialist inpatient, outpatient and community cancer care. Our Cancer Services are provided by many teams including medical oncology, radiation oncology, haematology, peritonectomy, brachytherapy, and palliative care. We are the tertiary referral centre for St George residents with a diagnosis of cancer and or blood disorders. We are also the only Public Hospital in NSW providing Seed Prostate, Breast and Skin Brachytherapy. Approximately 40% of our patients are from a cultural and linguistically diverse background. Funds raised by Dry July have previously enabled us to refurbish kitchenettes, improve inpatient ward waiting rooms, purchase waiting room chairs, purchase portable ultrasound machines, bladder scanners, weight scales, heavy patient lifting devices and other patient comfort items. All of these items have made it easier for our patients and their families affected by cancer. We thank you. We're proud to announce that St George Hospital has received a grant from the Dry July Foundation 2018 Grant Program. This year St George Hospital is using Dry July money to make patients a little more comfortable by focusing on new chairs. All areas of the hospitals’ cancer treatment areas endure high traffic and chairs wear out quickly; however, without outside funding support, timely replacement wouldn’t be possible. SGSHHS will also buy a portable ultrasound machine for the Haematology Oncology Day Centre, to assist clinical staff in guiding cannulations more accurately. 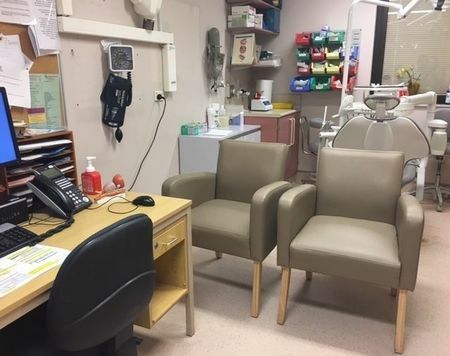 St George Hospital used funds to refurbish the kitchenette in the patient waiting area so that patients and carers can have a hot or cold drink while they wait, and also purchased new, more comfortable chairs. St George Hospital also used funds from Dry July 2013 to purchase high back chairs, low-low beds, an ice machine and blanket warmer for the cancer ward.